Stuff from Deneen and Cheryl! I traded a skein of cotton yarn with Deneen from Crochetville for this skein of vintage Bear Brand Deluxe All Virgin Wool. Thank you, Deneen! I’m thinking of felting it into something, but I’ll have to talk to it and see what it wants to be. Perhaps a tea cozy? Cheryl sent me these sweater booklets from her stash. Thank you, Cheryl! 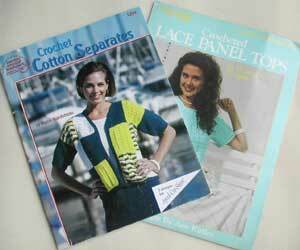 Crochet Cotton Separates by Joyce Nordstrom (American School of Needlework #1294) and Crocheted Lace Panel Tops by Ann Kirtley (Leisure Arts #733). 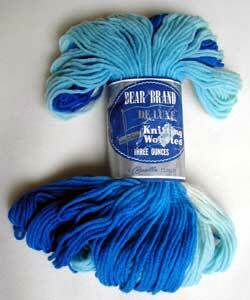 Pretty blues….definitely a tea cozy. Speaking of which, I might have to put that on my list of WIM’s…hmmm…..